In this qualitative study, the authors analyzed the participation of preservice teachers in a discipline specific Twitter chat known as #sschat. Findings indicated that preservice teachers found value in the chat when they shared resources with practicing teachers, had resources shared with them, and built professional networks. However, there were instances when the preservice teachers felt like they contributed little to the chat because they did not have extensive teaching experience. Additionally, the preservice teachers expressed dissatisfaction with using Twitter as a platform for educational related chats. The authors concluded that the utility of such chats outweighs the negatives provide guidelines that teacher educators should consider before asking their preservice teachers to participate in such spaces. In the last decade digital technologies have allowed for the development of online spaces that have provided educators with opportunities to engage in virtual chats focused on educational related topics on social media platforms such as Twitter (Benko, Guise, Earl, & Gill, 2016; Reilly, 2017; Xing & Gao, 2018). As Krutka and Carpenter (2016) noted, “Social media services like Twitter have been credited with providing a means by which people can coalesce around issues, interests, and events in ways that can impact the social studies and even democratic activities” (p. 39). 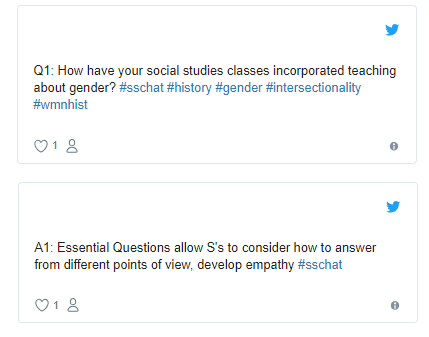 For example, the Twitter chat known as #sschat, has been developed specifically for social studies educators to better their craft (see https://sschat.org/about-us/). Additionally, scholars such as Swan and Hofer (2008) have examined the nature and utility of technology use within teacher education programs and K-12 classrooms. Scholars and educators tend emphasize the importance of social media in education without interrogating or deconstructing these spaces (Kerr & Schmiechel, 2018) before encouraging preservice teachers (PSTs) to take part in these environments. Therefore, this study joins ongoing efforts to research the use and impact of digital technologies to support educators in the development of their craft by examining the discipline-specific Twitter chat known as #sschat. We build on Krutka and Carpenter’s (2016) contention, as well as Hicks, Lee, Berson, Bolick, and Diem’s (2014) “Guidelines for Using Technology to Prepare Social Studies Teachers,” in which they acknowledged the benefit of digital technologies to support social studies teachers in the development of their craft. What does it look like for PSTs to participate in an online, discipline-specific Twitter chat? How do they describe their experiences? How do they participate in the chat? This paper begins with a description and discussion of the Twitter chat known as #sschat. Communities of Practice (COPs) are then examined, as they relate to participating and engaging in #sschat (although not everyone who tweets is a member of a COP). Findings from the study are then presented to show the benefits and limitations of Twitter chats as they relate to the development of social studies PSTs. Last are listed some suggestions for teacher educators interested in having their PSTs engage in Twitter chats. The Twitter chat/network known as #sschat was started by two people, Ron Peck and Greg Kuloweic, who had already been participating in #edchats. They believed that a discipline-specific chat would help them to improve their craft, and subsequently, the first #sschat discussion took place in July 2010 (Krutka, 2017). The chat has since taken place every Monday night from 7 p.m. to 8 p.m. Eastern Standard Time. Each Monday night, different coleaders, such as teachers, teacher educators, and guest speakers, moderate #sschat. The chats usually focus on a specific topic, such as “Bringing Elections to the Classroom,” “Women’s History and Gender Studies,” and the “Election of 2016,” to name a few. Figure 1. Screenshot from an #sschat session. The chat continues with this format until the hour is over, but sometimes discussions continue privately after the chat concludes. All discussions from these chats are archived and publicly accessible online at the website created specifically for #sschat (see https://sschat.org/archives/). Additionally, the hashtag #sschat is sometimes used to ask questions about social studies topics outside the chat. For example, a person needing a resource or an idea about how to teach a certain topic may tweet out a question during the day, and people will usually respond to the question. In many ways, #sschat has developed into a brand, as it now has a Facebook page, a website, as well as an in-person meeting that takes place each year at the National Council for the Social Studies (NCSS) conference (Krutka, 2017). The Twitter group under the hashtag #sschat has allowed for the development of, and arguably is, a COP (Burns, Howard, & Kimmel, 2016; Hoadley, 2012; Wenger, McDermott, & Snyder, 2002). Wenger et al. (2002) said, “Communities of Practice are groups of people who share a concern, a set of problems, or passion about a topic, and who deepen their knowledge or expertise in this area by interacting on an ongoing basis” (p. 4). Arguably, the word community most always has a positive connotation. However, COPs are not always welcoming to new or outside members (Johnston, 2016; also see Kerr & Schmiechel, 2018). Therefore, it cannot be assumed that joining a COP is always a positive experience, especially for the newcomer. Woodgate-Jones (2012) noted, “The pressure to conform (and therefore emulate the more experienced teachers) discourages the legitimate peripheral participants in these instances to share their own ideas” (p. 156). Therefore, in many instances the newcomers may try to emulate or replicate what the other members are saying or doing, instead of providing an authentic contribution to the community. Essentially, in the minds of many newcomers, to become a member means to act and behave like the other legitimate members; therefore, newcomers may struggle with developing their own identity in this new space. This process then problematizes the benefit of Twitter chats for PSTs, especially if that participation is brief, because PSTs may not have had the opportunity to become a full member and subsequently develop their own identity in this community. They may instead focus their efforts on becoming like the other members of the COP. Therefore, examining PSTs’ participation in #sschat provides a twofold benefit. First, looking at this community provides insight into the process of joining an online, virtual COP and to the affordances of such spaces for the field of social studies and beyond in relation to the development of PSTs. The research questions of this study were designed to provide insight into the benefits of this type of COP for PSTs and to provide guidelines for immersing PSTs in Twitter chats to further support their development into practicing professional educators. The forum #sschat is a Twitter chat and a professional space focused on improving the craft of social studies educators; responses are archived and publicly accessible. Social studies PSTs enrolled in a graduate program in a research-intensive university in the mid-Atlantic region of the United States were asked to participate in this study. The students in this program were enrolled in the same methods class, field experience, and educational technology class. While all three of these courses were separate courses, the same instructor taught both the methods course and the technology course. Additionally, the technology course, although separate, was interconnected with the PSTs’ field experience and methods class and the same students took all three courses together. This study focused on participation in #sschat in the fall 2016 semester, which is when the PSTs were in the early field placement instead of actively teaching a class as they do during their student teaching experience. Additionally, convenience sampling was used, and this study included a small sample size. All of these factors could be limitations to this study. The social studies PSTs were required to participate in three to five #sschat Twitter chats and document their experiences in online blog reflections. They had to at least participate in three #sschats and had a choice of how many they participated in beyond three, as they had the choice to join other networks, as wel,l in addition to #sschat. All participants went with the minimum number of three. The PSTs could choose any topic they wanted to for this assignment. For example, a range of topics were discussed from August 2016 to December 2016, such as “Honoring Indigenous Histories”; “Teaching with News Literacy in the Digital Age”; “Teaching with Comics and Art”; “Election 2016”; “Creating and Maintaining a Safe and Productive Classroom Environment”; “Listening and Speaking Skills in Social Studies”; “Teaching with Primary Source Documents”; “Local History”; “#Civility2016: Creating a More Civil Classroom This Election Season”; “Teaching Old Content New Tricks”; “Finding Ways to Engage Students with Existing Content”; “Document Evaluation and Claim Testing (Big History Project)”; “Digging Deeper During the Election”; “Capitalizing on Teachable Moments”; “Nurturing Empathy and Civic Engagement in Students”; “Elementary Social Studies”; “Election 2016: Looking Back and Forward”; “Slavery and the White House”; “NCSS Unconference (#NCSSUnCon) tweets”; “Media Literacy and Teaching Social Studies in the Digital Age”; “Teaching Slavery with Primary and Secondary Sources”; and “Teaching with Testimony: Enhancing Empathy and Critical Thinking” (see https://sschat.org/archives/). In spring 2017, an email was sent to PSTs who participated in #sschat in fall 2016 requesting a 30-45-minute semistructured interview focused on their experiences after participating in #sschat (see appendices for a list of interview questions). Although seven PSTs in this class participated in #sschat and documented their experience in blogs, only five agreed to participate in interviews (see Table 1). Any identifying information was blinded, and pseudonyms were assigned to ensure participant anonymity. #sschat archive transcripts of the chat sessions from fall 2016. What follows is a description of each data source and what it offered to this study. Interviews with PSTs were conducted face to face. The interview questions served as a guide, and the interviews were approached as more of a conversation between the researcher and the participant, rather than a formal question and answer format. The goal of the interviews was to examine the “lived experience” of the PSTs and to see if the chat was perceived as having utility for them in their current or future practice (as in Seidman, 2013, p. 9). All interviews were recorded and transcribed. The transcript data were compared to the blog reflections and #sschat archives, which are addressed in greater detail later in the data analysis section. The blogs the students completed were part of a class assignment in which the PSTs had to participate in #sschat and then reflect and document their experience in a blog; the blog reflections were supposed to be around 300-500 words. The blogs were used as a point of comparison with the transcript data to see if what they said in the blogs resembled or reflected what they said in the interviews. The #sschat forum archives all chats, and they are publicly available and accessible. However, in order to pull this data for analysis, the transcripts were cut and pasted from the #sschat website and placed in a digital document for further examination, providing greater ease of use. These archives served a key purpose in being able to identify the extent to which and how the PSTs participated in the chat. We first sifted the data looking for large thematic codes across the transcripts, known as thematic analysis (Maxwell, 2005). We approached the data in multiple ways, but eventually assigned two parent themes of positive and negative to the language that we perceived as having a positive or negative tone. This approach best captured and illuminated the experiences of the PSTs in terms of them becoming a new member of a COP, because this process can be both a positive and negative experience according to the research. We then used a pink highlighter to distinguish the positive comments and yellow to distinguish the negative comments. We cut the quotes up and placed them in three separate folders marked positive, negative, and neutral. We spread all of the positive quotes out on a table and identified the nature of the positive data. Specifically, we looked for what the PSTs were talking about when they were speaking in a positive way. We found that the nature of the positive quotes coalesced around codes that we identified as “Sharing Language” and “Networking Language.” Our next step was looking at the negative data. We followed the same format as with the positive data, parsing out the comments and looking at what the PSTs were talking about when their tone was negative. Two codes were generated in relation to the negative data, which we called a “Lack of Teaching Experience” and “Unfamiliarity With Twitter” (see Table 2; this table was adapted from Boggs & Stewart, 2016, coding dictionary). Identified #sschat as a place of sharing resources, strategies, or ideas. Saw #sschat as a key source of networking and community building. Felt unable to fully participate and provide resources due to a lack of classroom experience Did not have a background with Twitter which caused stress and anxiety in the context of a live chat. These codes informed how we approached looking at the blog data. Therefore, we searched for similar parent themes of positive and negative in the blog reflections and distinguished them with a pink (positive) and a yellow (negative) highlighter. We then evaluated whether the nature of the positive and negative comments was similar to what we saw in the transcripts; we found a strong similarity between the two sources of data. Finally, we analyzed specific chats that the PSTs identified they had participated in to see how they participated. To analyze these properly, we copied and pasted full chats into a digital document and looked for specific instances of when the PSTs participated in the chat. For example, we looked at how the PSTs participated by seeing if they offered strategies to the teachers or simply offered unsubstantive comments because they were required to participate. We looked for examples where we determined whether the PSTs’ comments looked like something a teacher would write. Specifically, we wanted to find examples where the PSTs shared ideas based on their experiences. The findings from the archives come last in the narrative, because we wanted to tell the story of how the PSTs participated in #sschat from their perspective and then compare that data with what we saw in the chat archives. The three data sources (interviews, blogs, and archive transcripts) were triangulated to build the picture and tell the story reflective of the experiences of the PSTs (as recommended in Rossman & Rallis, 2003, p. 65). We asked the following questions of the qualitative data: What does it look like for PSTs to participate in an online, discipline-specific Twitter chat? We also considered two subquestions: (a) How do they describe their experiences? (b) How do they participate in the chat? In this instance, Katy drew a direct line between what she saw in the classroom and what was discussed in the chat. One of Katy’s tweets from a chat support this connection. For example, Katy also said, “To evaluate claims, we [her early field placement class] practiced on primary sources. In my placement we try to focus on cartoons #sschat” (PST Tweet, 2016). Therefore, #sschat was seen as a supportive and helpful space because the ideas shared related directly to her current placement and situation. Katy also enjoyed when resources were shared with her, especially resources she could immediately use in her placement. Katy was excited about the chat because she was able to take something from it and use it immediately in her placement, which reinforced the relevance and utility of the chat. Melissa, who was not significantly older than her K-12 students, felt like her presence offered something different to the veteran teachers, because she knew how to make content more applicable or relevant to the students. Additionally, some of Melissa’s comments in the Twitter chat seem to capture this sentiment of positivity and insight she believed she offered. For example, she said in one instance, “Absolutely agree that understanding & recognizing bias is essential as history students! Can’t just ignore #sschat” (PST Tweet, 2016). It appears that Amy and Jenna both saw the value of the #sschat archives as a way to help them develop new ideas, strategies, and resources. Additionally, Katy wrote in her blog, “Sschat can contribute to student learning by keeping me up to date on the best research-based practices and strategies.” However, whether these PSTs actually continued to use the archives is unknown. Additionally, Martha reflected in her blog, “However, the most rewarding experience [of #sschat] was sitting with many of our cohort members and talking to them about our responses as we submitted them. This personal component made chats fun and personable.” The PSTs found value in having outside support while doing the chat, possibly because they lacked experienc­e, but that subject will be addressed in more depth later on in the article. Sarah also wrote in her blog, “This week was especially fun for me because I saw my 11th grade civics teacher was participating [in #sschat] and gave me her email and said she could be my reference [if] I ever needed one when looking for a job.” Therefore, the PSTs found value in #sschat in terms of developing a network of support with other educators, which then allowed them to become better social studies teachers. However, their responses become more complex in light of their negative comments after participating in #sschat. Amy went on to write in her blog, “I found myself able to answer these questions [evaluating claims] but wishing that I had more experience in the classroom to better reply to questions.” Amy’s interview response and then her related blog reflection seemed to suggest that her lack of resources and inability to produce those resources quickly was tied to her lack of experience. Martha felt even more strongly about her lack of contribution to the chat. She said, “No, I don’t think I offered anything really different [to the #sschat community]. I mean, I had slightly different ideas, but no, I think they would have done just as well without me there” (Interview, Lines 174-175). Martha’s tweets also indicated that because she lacked experience she was unsure if her comments were even valid. For example, in one instance she used a question mark at the end of her comment which seems to suggest she was unsure if she was offering sound advice. Martha said, “My students rarely question their sources. Maybe annotated bibs before they write a paper? #sschat” (PST Tweet, 2016). The PSTs expressed a range of feelings about what they offered in relation to the chat. For example, Melissa felt like she offered a new perspective and Martha believed she offered little to nothing. However, the majority of the qualitative evidence suggests that most PSTs felt they offered very little to the veteran teachers, even though they saw value in the chat. Also, Martha expressed frustration with trying to communicate within the character limit. These two PSTs were dissatisfied with Twitter for different reasons. Twitter chats stressed Amy out, and Martha did not like the tone of comments within the chat. Melissa also wrote on her blog, “It’s not only frustrating [the Twitter platform], but it limits the depth and complexity of answers from anyone participating in the chat.” Therefore, Melissa was both dissatisfied with the format of the chat and also the lack depth in relation to the chat comments. However, this frustration could change in light of Twitter changing the amount of characters allowed in each post. The previous findings can be further contextualized by comparing those data sources to what we observed within the #sschat archives. The PSTs saw value in the chat when they could receive strategies and mostly saw value in themselves when they could provide strategies back to the teachers. Since the PSTs lacked experience, they believed they did not have much to offer. However, after evaluating several chats, they arguably offered more than they thought they did (see Table 3 for examples of what some of the PSTs said within the chats). When examining what the PSTs offered in the archives, it appears they sold themselves short in terms of what they were able to add to the conversation. If they had not introduced themselves as PSTs at the beginning of the chat, it is not apparent whether anyone would have even known the difference between the PSTs and an experienced teacher when looking at their comments. For example, Katy offered a specific example of what she was doing with her students, Amy provided an idea for collaboration, Martha provided a specific scaffold for analyzing historical sources. Melissa also provided a lesson idea, and Jenna offered a resource; they were contributing significantly to the chat. However, it is also of interest that some of the more active teacher participants in #sschat participated well over 10 times over the course of a chat. In contrast, many of the PSTs would only participate around five to seven times during a chat, although Melissa participated 12 times in one chat. Aside from Melissa, the PSTs may have done the bare minimum to meet the requirements for the assignment, rather than trying to become fully enculturated in this community, which could influence the way they reflected on their experiences with #sschat. On its website #sschat described itself as a place where educators share their knowledge so that they can better the craft of themselves and other fellow social studies educators. Therefore, when the PSTs added to the chat and took away strategies and ideas, they felt like they were utilizing this space in the way it was intended. However, when they could not participate by adding, they perceived a lack of value. This perceived lack of value is consistent with the literature on COPs (Burns et al., 2016; Hoadley, 2012; Wenger et al. , 2002). For example, perhaps the PSTs felt as if they needed to add specific strategies because that is what the other full members of the community were doing. Therefore, in instances when the PSTs were unable to contribute, they felt illegitimate because they felt like they lacked credibility (as also noted by Kim & Cavas, 2013). With the exception of one of the participants, the PSTs did not consider that they offered a new perspective to the practicing teachers. The tension the PSTs felt in terms of not being able to contribute speaks directly to the concept of legitimate peripheral participation (Fuller et al., 2005; Kim & Cavas, 2013; Lave & Wenger, 1991; Woo, 2015; Woodgate-Jones, 2012). Becoming a new member of a COP is not always a smooth process, and the PSTs exemplified firsthand what this process felt like for them. Their discomfort had nothing to do with how they were treated, but how valuable they felt intrinsically in this community. Therefore, when they could not emulate the other members, they felt like they did not belong and struggled to conceptualize who they were in this informal learning space. Woodgate-Jones (2012) noted “the potential for great conflict in identity formation when joining a COP” (p. 150). The PSTs felt like what they had to contribute to the chat was theoretical because it was divorced from practice. However, they did not consider that they may be learning newly developed, research-based strategies that would be of benefit for the other teachers who are not currently enrolled in a methods class. For example, in the once instance Martha offered a historical analysis scaffold she had learned about in class that none of the other practicing teachers indicated that they had used or even heard about. In this instance, Martha provided something new to the practicing teachers. When looking in the archives at the types of information the PSTs provided, such as the case with Martha, the PSTs offered insight, strategies, tools, and ideas in their comments. The PSTs were close to the research and the literature, but did not realize the potential utility of their knowledge to the in-service teachers. Although the PSTs had a great deal of knowledge, when asked to reproduce their knowledge on Twitter, they did not feel they had any routines or habits (as defined by Ahmed & Jones, 2008; Bourdieu, 1977) and, essentially, did not know how to play the game or perform their role in front of the other practicing teachers (see Holland, Lachicotte, Skinner, & Cain, 1998; Morrison, 2005). They lacked the needed dispositions and it appeared that they did not have what Bourdieu (1977) called “habitus” (see Ahmed & Jones, 2008; Morrison, 2005). Morrison (2005) noted, that habitus “both enables creativity and constrains actions and practices, combining action/agency and structure” (p. 314). Within the structure of #sschat, the PSTs did not exhibit creativity, but exhibited constraint. For the PSTs, Twitter was in a sense, a figured world (Holland et al., 1998; Urietta, 2007). In a figured world, the participant tries to determine who they are in this new space that is different, although connected to the actual world (Holland et al., 1998; Urietta, 2007). In the case of #sschat, the PSTs were navigating their identity as PSTs who knew a great deal about the field of social studies and teaching strategie. At the same time, they lacked what some people call pedagogical content knowledge (Shulman, 1986), and they, therefore, did not know if what they knew was of value in this new space. Although they were in the process of growing and developing the needed dispositions, this growth was uneven among the PSTs. Furthermore, the PSTs did not consider that their presence challenged the other full members of the COP to help them to learn. As Fuller et al. (2005) found, “For example, our research has demonstrated that experienced workers are also learning through their engagement with novices, and that part of the process of legitimate peripheral participation for many novices is to help other workers to learn” (p. 64). In the context of #sschat, the PSTs offered the full members the opportunity to help them develop more as teachers and may have even helped the practicing teachers reflect about the criteria for effective practice so they could then explain it to the PSTs (as suggested in Woodgate-Jones, 2012). Although the PSTs did not fully buy into #sschat as a space of utility for them, they liked knowing that the community existed, even if they did not foresee themselves participating in anymore chats. They also liked knowing the chat archives were a resource they could depend on in the future. The PSTs liked the product of the chat, but not the process of participating in the chat outside of doing the chat together as a cohort. Additionally, one arguable benefit of Twitter chats is that teachers can engage in them from any location, but the PSTs took the opposite approach and chose to engage collectively. Their preference to do the chat together could speak to their lack of confidence in themselves; being in a group helped to mitigate this issue and their collective presence helped to build their confidence. While research indicates the benefit of Twitter for creating a COP for teachers, in the context of this study, it was a much different story. Some of our participants also got lost in the chat, finding it hard to keep up with the pace of the exchanges. Similarly, Xing and Gao (2018) found that “when a chat generates three or four tweets every second, it might overwhelm some participants” (p. 396). That is certainly the case with #sschat in this study, especially due to a large amount of people answering the questions. There is still value in PSTs participating in #sschat, as well as other educational chats, even amid the issues the PSTs identified. Neither was the forced participation of the PSTs in #sschat necessarily negative. For example, research by Burns et al. (2016) indicated that forced participation is not necessarily a cause for concern. Burns et al. forced participants to engage in a discussion on Blackboard for a class assignment. One of the participants noted that without being forced to respond to others, she would not have participated, because someone had already said something similar to what she wanted to say. Therefore, she felt that being forced to participate was a good thing for her; otherwise, she would have not engaged with others. Because the PSTs in this study were forced to participate, they now know about a COP and resources they would not have known about otherwise and may pursue other professional opportunities in the future because of their experiences in #sschat. This study exemplifies the need of a space for PSTs to learn from a knowledgeable other (Hoadley, 2012) in a manner that scaffolds their needs as neophytes. Although there were knowledgeable others in this community, it was a struggle for the PSTs to participate, because they perceived the chat as being focused on those with classroom experience. However, the struggle the PSTs felt can be mostly mitigated with careful planning and preparation by teacher educators. If a teacher educator wishes to have PSTs engage in a Twitter chat such as #sschat, the following guidelines should be followed to address the issues voiced by the PSTs in this study. Although not all PSTs need a Twitter tutorial, it may still be a good idea for instructors to discuss Twitter, how to use it, and the utility of such spaces for teacher preparation and professional development. PSTs could first look at the types of chats that are available and then identify the benefit of such spaces for their own practice. PSTs may need to be introduced to Twitter as an idea generator/democratic space where all ideas are shared and valued, which is in line with the mission of #sschat. More specifically, PSTs in social studies may need to spend some time exploring the #sschat website in order to fully understand the purpose of the network known as #sschat. PSTs may need support in seeing what they offer to practicing teachers in a Twitter chat. This support could be accomplished by having the PSTs do graffiti on large chart paper to reflect as a group about what they may offer in this space to other practicing educators. PSTs need to be aware of resources that make participating in a Twitter chat less stressful. For example, there are tools that add the hashtags automatically to comments and allow the experience of a Twitter chat to not to be so overwhelming (see tweetchat.com). Teacher educators could develop an assignment in which PSTs explore Twitter tools and then report back to the class what they found to be useful. PSTs may need more conceptual support about what a COP offers to them as beginning educators and more explanation about what the process of becoming a new member of a COP looks and feels like. This approach could help them contextualize and understand their own experience when becoming a member of this new space. PSTs may need to have early exposure in teacher education programs to informal learning spaces and the concept of a COP, in general. Future research might incorporate these guidelines at the beginning of the semester and then have the PSTs participate in #sschat over the course of a year. Similar data to what we used could be collected to compare it to this study to see how or if the experience and perceptions of PSTs differ after implementing the guidelines that we propose. Conducting such a study would prove useful to the field of education writ large and to social studies specifically. For in-service teachers #sschat provides an opportunity and a space to exchange ideas, methods, and strategies and have vetted resources to try in their classroom the next day, thus meeting “their immediate instructional needs” (Hicks et al., 2014, p. 445). Meeting the needs of PSTs, however, becomes a bit murkier and more complex. Nevertheless, after considering the guidelines we offer in retrospect as a result of this study, having PSTs participate in #sschat is still a worthwhile experience that can meet their needs when they are provided with the right scaffolds. Abbott, A. (2010). Varieties of ignorance. The American Sociologist, 41(2), 174-189. Ahmed, N., & Rees Jones, I. (2008). Habitus and bureaucratic routines’, cultural and structural factors in the experience of informal care: A qualitative study of Bangladeshi women living in London. Current Sociology, 56(1), 57-76. Bourdieu, P. (1977). Outline of a theory of practice. Cambridge, UK: Cambridge University Press. Burns, E. A., Howard, J. K., & Kimmel, S. C. (2016). Development of communities of practice in school library education. Journal of Education for Library and Information Science, 57(2), 101-111. Course syllabus for inquiry based learning with digital technologies. (2016, Fall). Course description. WHERE CAN THIS DOCUMENT BE FOUND BY THE READERS? IS THERE NO AUTHOR? Fuller, A., Hodkinson, H., Hodkinson, P., & Unwin, L. (2005). Learning as peripheral participation in communities of practice: A reassessment of key concepts in workplace learning. British Educational Research Journal, 31(1), 49-68. Hoadley, C. (2012). What is a community of practice and how can we support it? In D. H. Jonassen & S. M. Land (Eds. ), Theoretical foundations of learning environments (2nd ed., pp. 287-300). New York, NY: Routledge. Holland D., Lachicotte W. Jr., Skinner D., & Cain C. (1998). Identity and agency in cultural worlds. Cambridge, MA: Harvard University Press. Johnston, D. H. (2016). ‘Sitting alone in the staffroom contemplating my future’: Communities of practice, legitimate peripheral participation and student teachers’ experiences of problematic school placements as guests. Cambridge Journal of Education, 46(4), 533-551. Kerr, S. L., & Schmeichel, M. J. (2018). Teacher twitter chats: Gender differences in participants’ contributions. Journal of Research on Technology in Education, 50(3), 241-252. Krutka, D. G. (2017, March). The# sschat network: History, purpose, & implications of a subject-area community. In Proceedings of the Society for Information Technology & Teacher Education International Conference (pp. 2190-2200). Waynesville, NC: Association for the Advancement of Computing in Education. Maxwell, J. A. (2005). Qualitative research design: An interactive approach (2nd ed. ).Thousand Oaks, CA: Sage. Morrison, K. (2005). Structuration theory, habitus and complexity theory: Elective affinities or old wine in new bottles?. British Journal of Sociology of Education, 26(3), 311-326. Rossman, G. B., & Rallis, S. F. (2003). Learning in the field: An introduction to qualitative research (2nd ed.). Thousand Oaks, CA: Sage. Seidman, I. (2013). Interviewing as qualitative research: A guide for researchers in education and the social sciences. (4th ed.). New York, NY: Teachers College Press. Sorin, R. (2004). Webfolio: An online learning community to help link university studies and classroom practice in preservice teacher education. Australasian Journal of Educational Technology, 20(1), 101-113. Stewart, T. T. (2011). Transactional analysis: Conceptualizing a framework for illuminating human experience. International Journal of Qualitative Methods, 10(3), 282-295. Stewart, T. T., & Boggs, G. L. (2016). Emerging dialogic structures in education reform. Dialogic Pedagogy: An International Online Journal, 4, 142-161. Trust, T. Krutka, D., & Carpenter, J.P. (2016) “Together we are better”: Professional learning networks for teachers. Computers and Education. 102. 15-34. Urrieta, L. (2007). Figured worlds and education: An introduction to the special issue. The Urban Review, 39(2), 107-116. Wenger, E., McDermott, R. A., & Snyder, W. (2002). Cultivating communities of practice: A guide to managing knowledge. Cambridge, MA: Harvard Business Press. Woodgate-Jones, A. (2012). The student teacher and the school community of practice: An exploration of the contribution of the legitimate peripheral participant. Educational Review, 64(2), 145-160. Xing, W., & Gao, F. (2018). Exploring the relationship between online discourse and commitment in Twitter professional learning communities. Computers & Education, 126, 388-398. What did you all talk about in your #sschat? What stands out about using Twitter as way to participate? What experiences did you have prior to using twitter or engaging in discussion online? Have you ever used social media for discussion prior to #sschat? Do you believe you are a skillful user of social media? Why? What skills does someone need to have to be able to participate in #sschat? When did you decide to participate? How long have you participated in #sschat? Did you prepare for #sschat? If so, how? What did you do during the discussion? What was your favorite topics on #sschat? What was the most well remembered event and learning from participating in #sschat? Were there any challenges to actual participation in real-time? What were the struggles to participating? Why? Can you provide examples of when you felt engaged in the chat? What do you think you offered? Do you think there are different ways to chat in this environment? How did people respond to you and how did you feel you responded to them in the chat? What allowed you to feel comfortable in participating? What led you to feel like you were not ready to participate? Will you continue to use it? If so, how? What are the positive outcomes of participating in this community? What are the opportunity costs and challenges? What changes in format would you like to see to improve the chat?